Barron’s Cover: Where’s The Little Guy? Over the weekend, Barron’s coverstory was “Where’s the little guy?”. Basically it pointed out that while the market has gone (almost continuously) higher, there has been a lack of participation from the “little guy” or retail investor. This is something that I wrote about at the beginning of May, when I asked, Where are the retail investors? 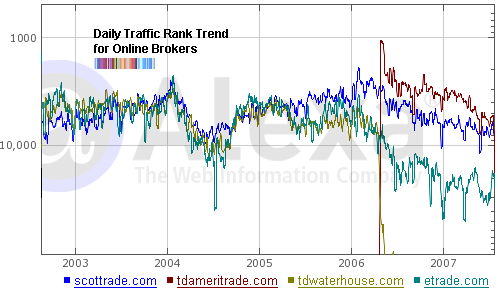 In that note, I looked at the internet traffic directed to the major electronic retail stock brokers. My logic being that the level of activity from retail traders would show up as they logged on to their accounts online. I call this my “sheeple index”. Unfortunately the best data source for internet traffic is Alexa. It is a flawed measure for various reasons but still, I do believe that it does show more or less the level of interest that regular people have in the stock market. Especially when such apathy is confirmed through various sentiment measures. Here’s an up-to-date version of the graph I showed before. The graph is a bit “herky-jerky” but more or less it shows the same trend continuing. We are not seeing any excitement for the stock market from the regular folks out there. Which in a strange way is just fine. But only for a while. Eventually the bull market will need an infusion of capital to sustain itself. And the sheer size of it demands that it can only really come from one source, the retail investor. If the market continues to go higher, its siren call will in the end lure in even the least enthusiastic. I agree with Barron’s that it would help galvanize the attention of the public for a very successful and widely known company to go public. The technology boom of the late 1990’s had Netscape, the quiet bull market of the mid 2000’s had Google (GOOG). We need another one of those. You said that the bull market will need an infusion of capital to sustain itself, but wouldn’t that just make the eventual downtrend more painful and severe? What I got from the article is that dumb money tends to come in at the end of a bull cycle, bid up stocks to outrageous and unsustainable levels (as what happened in the 90s) which causes the market to fall hard. If the retail investor never shows up will we have a soft landing as earnings growth slows? I tend to believe an absence of the retail investor makes the market less volatile; but I could be completely wrong. Rob, the infusion isn’t a Bam! one time thing. It is a drawn out process. The retail investor will slowly leg into the market. The final blow-off or the popping of a bubble mania is when the participation of the “dumb” money reaches a climax. But until that happens, the bull market will need the incremental entry of new capital. Of course, the retail investor is here in the market. We just don’t have many of them. As for their lack of activity being behind the lack of volatility, perhaps. I would argue however that the massive program buying/selling which parses prices to finer and finer levels is to blame. That and the gargantuan amounts of money being run that sell volatility to create a bond like yield.